Learn more about how magnets are often assembled and used to make magnetic grates. These assemblies are often used to remove magnetic particles, steel parts, nuts and bolts, or other contaminants from other materials. Magnets are often used to help separate ferromagnetic materials from other substances. We hear from many of our customers who use magnets to separate materials in a wide range of applications. For many decades, powerful magnets have been used to separate unwanted matter from grain flowing through a tube or chute. Think of removing small nuts and bolts or bits of barbed wire while filling a silo with grain. This is very important for preventing sparks and possible explosions in a silo! More recently, more and more researchers in biology are using magnetic particles and neodymium magnets to separate things in suspension. If you have a fluid that contains, say, some bacteria and other stuff, how can you separate the bacteria? Apparently, there’s all sorts of tricks to get such enzymes to grab onto bits of magnetic material (think nano-sized iron dust). Put a strong magnet at the bottom of your test tube, and those magnetic bits with the interesting enzymes or whatnot are attracted to it. When you pour out the contents, the magnetic bits remain behind. In this article, we’ll focus on the magnetic grate. We’re often asked about how these interesting devices are constructed and which magnets to use. How do they work? How are magnetic grates constructed? Typical construction of a magnetic grate is shown. Not shown is the 316 stainless steel tube in which this stack of magnets and steel washers (or pole pieces) are inserted. Most of the grates we’ve seen are made with tubes of non-magnetic stainless steel with an assembly of magnets inside. The stainless is sealed shut, usually with a weld, which keeps the magnets free from contamination. The magnets inside the tube are usually arranged in a row, usually with ring magnets sitting on a shaft. The magnetization direction each successive magnet is assembled in the opposite direction, so that the direction alternates with each magnet. This specific arrangement is used to create a powerful magnetic field around the assembly. It produces an extremely high magnetic field right at the steel “pole pieces,” and can exceed 10,000 gauss! Tiny bits of iron and steel are attracted to the magnet, with the most force in the locations where the magnetic field strength changes the most. Near the pole pieces, this setup can exert a very strong hold onto even fairly small pieces of iron or steel. Why are they constructed this way? One reason is that you want to extend a strong magnetic field as far out as possible from the tube, to catch ferromagnetic particles from as far away as possible. This setup uses common, axially magnetized ring magnets to produce a magnetic field in a region around the cylinder. It is also strong all the way around the circumference of the cylinder, unlike a diamagnetic magnet, which is strongest at two points (the poles located 180° apart). The second, and perhaps more compelling reason, has to do with holding onto the bits of iron or steel to the magnet after they are caught. The force exerted on a tiny bit of iron depends on both the field strength and the field strength gradient at given location near the magnet. The gradient is how much the field strength is changing with distance from the magnet. In this setup, we get both. Extremely high field strength in the region of the pole pieces, combined with a huge gradient in that location (it’s only high in a small area), make it very hard to pull stuff off the magnet once it is caught. For applications where we have a flow of non-magnetic stuff running over it, a strong hold is important. This helps captured material stay stuck to the grate, rather than being brushed away by passing material. In a completely different application, this setup might remind you of Cow Magnets. Why is a small steel ball (or other shape) attracted to a magnet, anyway? 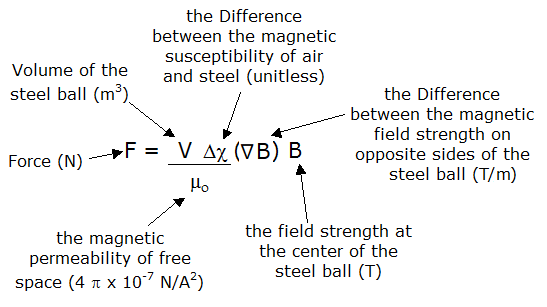 A formula we used to calculate force on a small steel sphere near a magnet assembly. Though this formula is often quoted in scientific papers, and results from it seem to match our own simulations, the units don't seem to work out. How does a steel object that is some distance away from a magnet get pulled towards the magnet? To understand this, we took a closer, more technical look at the basics of magnetic attraction. We put some of the details of this analysis here, in PDF format for our more technical readers. We describe some of the ways we used the formula shown at right, in a few different situations. We used it in a simple configuration to verify the formula's accuracy. We later used it with our study of magnetic grate assemblies. What’s the executive summary of all that analysis? Ferromagnetic materials are most attracted when you have both a strong magnetic field and a strong magnetic field gradient (its strength changes quickly across a distance). Ignoring all the other bits, which might be considered constant, that's the B and the delta-B in that formula. Oh, right, we’re supposed to be discussing magnet grates. All that technical stuff is interesting, but why bring it up here? How is it relevant? Because it helps us answer why the concentrated fields in magnetic grates are so great. The force on a bit of steel near the magnet assembly depends on the field strength and field gradient near our magnets. We used the formula from that PDF to estimate the force in various situations. To pull an 1/8” diameter NSB2 steel ball away from the surface at the center of a ½” D88 cylinder magnet, it takes about 6 oz of force. To pull the same NSB2 steel ball way from the edge of the D88 magnet, where the field strength is a big higher, it takes about 9 oz of force. To pull the NSB2 steel ball that’s stuck to our 5/8” diameter magnetic grate assembly at one of the steel washers requires 21 oz of force! That shows why the concentrated field strength at the steel spacers works so well for this sort of magnetic assembly. It provides a much stronger hold on the steel particles that it is catching. This makes the captured material much less likely to be bumped off by other non-magnetic material flowing over the grate. The remainder of this article talks about how to assemble magnetic grates like this. For our earlier demonstration, we used some 5/8" diameter ring magnets and steel washers. Note that the steel washers, often called "pole pieces," are NOT made of stainless steel. They should be made out of ferromagnetic steel -- they stick to magnets! You could construct similar assemblies with different diameters. Below, we mention a few magnet and steel washer combinations that make sense to us. Of course, you don't have to use our steel washers -- you might use different steel pieces. Also not mentioned here is that these magnets are usually sealed up inside a non-ferromagnetic stainless steel tube. How you construct such tubes might also influence your choices. Here is a video showing us assembling one of these magnetic grates that we used in the earlier demonstration. It is a 5/8" diameter grate made with six RA24 ring magnets and seven NSW82 steel washers.